Here at Prohibition we pride ourselves on top notch service. 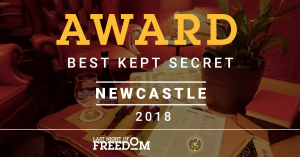 Playing host to all manner of events, private parties and shows the venue consistently receives excellent feedback which is always welcome music to our twitchin’ ears! “Hey Mitch – just a quick one to say thanks for Saturday night. We had a wonderful time, and everyone was talking about how great the venue was. So thanks!” – Lewis, 40th Birthday. “Hi Mitch, Thanks so much for Saturday – it was fantastic! Everyone can’t stop talking about how much they loved the bar! All the staff were fantastic! Thanks again!” – Zoey, 25th Birthday. “It’s what every bar in New York is trying to be.” – Postmodern Jukebox, aftershow Jam. “I just wanted to say thank you ever so much for a wonderful evening last night at the Burluskers Delight event. Your venue and atmosphere felt so welcoming (which was much needed for my first solo performance! )” – D’arcy Debonnaire, Burlesque Performer. “I booked Prohibition last year for my Hen Party and it was a fantastic night. Mitch couldn’t have been more accommodating, the bubbles flowed and everything ran like clockwork, thanks to the wonderful staff. We all had the best time and I am so grateful.” – Clare, Hen Party. “We had our 10th wedding anniversary party here last night. It was outstanding. Excellent location. Cracking staff. Great drinks. A perfect night enjoyed by all. Thank you Mitch and gang. Can’t wait to go back. A true hidden gem.” – Susan, Wedding Anniversary. 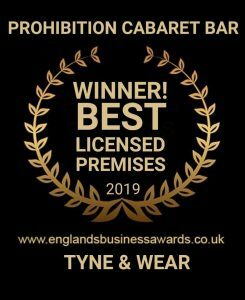 Prohibition is enjoying hundreds of 5 star Facebook and Tripadvisor reviews and of course we’re working on earning our Number 1 rating on Tripadvisor for our former premises in Gateshead to our new premises in Newcastle, plus we’re delighted to receive the ‘Best Licensed Premises – Tyne & Wear, 2019’ Award from Englands Business Awards and the ‘Best Kept Secret – Newcastle, 2018′ Award from Last Night of Freedom.com! Got a question? Got an act? Got a product to tempt us? Got beef? Drop us a line! We’d love to hear from y’all.